Before starting, it's important to draw a distinction between normal (single FDB file) catalogues and SQL-based catalogues created via SQL Connect. SQL users should get to the bottom of this page for advice on updating SQL catalogues. The need to update catalogues normally arises because the client (and/or other components) are being upgraded. From the advice below you should see that updates shouldn't require upgrading your catalogues, whereas upgrades will definitely require this. Updating vs. upgrading Portfolio software is discussed in a separate FAQ. As a general premise you should assume that the catalogue schema for an FDB file will change from major version to major version. So a v5 catalogue will not be the same internally as a spell v6 catalogue, and so on. The differences, to v8.5, are: v4.x, v5.x, v6.x, v7.x, v8.0.x/v8.1.x, v8.5.x. Note that v8.5 breaks the broad rule about the format changing only on major version number. Don't worry about the word 'schema', for ordinary users it suffices to know that the files will differ internally the most obvious sign of this being that some fields get added to the default built-in fields. Catalogues are upgraded by opening them with a new client. A client will normally be able to open the last two version's catalogues successfully and upgrade them, e.g. you would expect a v8.5 client to upgrade v7.x and v8.x catalogues. Updating catalogues from much older versions may require installing an old the client and updating in several stages, e.g. from v4 to v6 to v8 to v8.5. The latter scenario can occur because there are a good number of CD-based clipart libraries around that included v4 catalogues on them. You can always try opening any older catalogue in your latest client but if you get an error message the likelihood as you may have to update via one or more older client versions. If you require older versions of a client in order to do this sort of sequential upgrade you should contact Extensis Technical Support for advice on how to obtain the necessary software. You will only need to install one copy of any older clients. This FAQ will help explain the implications of installing more than one client at a time. With metadata, bear in mind that XMP only came in circa v7. Meanwhile back in the mid 90's (v3/v4) not many people were embedding any metadata at all, with some stock libraries being a notable and pertinent exception. The current metadata tag & mapping system only came in with v7. The HTML export templates were embedded in the app from v3-v6, being replaced completely in v7+. If you need templates from older catalogues you'll need to export them before leaving v6 at the latest. Even so, they will need manually editing for use with v7+ NetPublish/Create webpages. Upgrading a catalogue using a client can only be done in standalone mode, with the catalogue not in use by any other Portfolio component. This means that you must unserve any served catalogues before trying to upgrade them. In a multi-user scenario to allow some planned down-time for Portfolio Server and NetPublish Server services to users. Do not attempt to connect from a client to a Portfolio Server of a different version; at best it won't work at all at worst you might somehow connect to it and possibly corrupt a catalogue - so don't try! Don't forget to back up! It should be second nature, but you want to ensure that anything goes wrong when upgrade that you still have a clean copy of the original. In the simplest sense this back up can simply mean making a local copy of the FDB file and then upgrading one or other file. Recover the catalogue (like this). For small or test catalogues this isn't really needed but for production catalogues, especially those that are large in size or are used very regularly, you should recover first. This ensures any internal corruption (of which you may be unaware) is cleaned up before the upgrade. A side benefit is that the catalogue is also compacted making the overall file size smaller. If you open the catalogue by mistake and don't want to update it either cancel completely ('Cancel' button) or take the option to open as read-only ('Don't Convert' button). This opens the catalogue without altering the existing internal layout but does so read-only meaning that you can view data but you cannot alter it. If you do mean to upgrade the catalogue then click on the 'Convert' button. The client will now make the necessary changes to turn the catalogue into one for the client version. The time taken will depend on the size of the catalogue. A small catalogue on the desktop may take a matter of seconds. A large workgroup catalogue may take a lot longer, so ideally don't be running lots of other CPU intensive processes at the same time. In the latter case it is also worth considering where you will do the upgrade process. Best practice is to have a licence client on your Portfolio Server computer allowing you to easily unserved catalogue, upgrade it and re serve it all using the servers greater power. You will know the upgrade is successfully complete when the catalogue opens in the client. In standalone user scenarios that is all you need to do, whilst for Portfolio Server you must now re-serve the catalogue (and republish via NetPublish Server, etc.). Once you're happy using the newer version of Portfolio you should consider going back and updating older version catalogues in your various backup locations. This avoids embarrassing scenario of needing a backup and then possibly having to upgrade it through several versions before being able to use it. Whilst in the transition phase where you might be using one version and testing another do be careful not to upgrade a catalogue by mistake. In this regard the dialog shown above is your friend; if in doubt click 'Cancel'. If doing a lot of testing or supporting several different versions within your organisation consider putting a number at the beginning of key catalogues to make sure you know which is which, e.g. '7main.fdb' and '85main.fdb', though that may not be feasible for life production catalogues. OK, despite all the advice above you've managed to upgrade your catalogue. What to do? The following advice definitely falls outside formal guidance but may get you by they don't use it as a planned procedure. You will find that in most cases you will be able to open a catalogue in the previous versions client although clearly any new features or new built-in fields won't be available; in the circumstances the latter shouldn't matter. If you are able to open the upgraded catalogue in the older client simply make a new empty catalogue with similar customisation and then drag all records from the upgraded catalogue to the new one. Check that the new catalogue functions correctly and then you can delete the mistakenly upgraded catalogue. The fact that you can at times open a new catalogue in an older client shouldn't be used as part workflow. Don't expect any help from technical support if you report a problem try to use this technique. A brand-new clean file with no legacy corruption. All new fields are correctly configured (in the past sometimes new features weren't properly implemented in client-upgraded catalogues. You will need to create or custom fields, Saved Views/Finds, metadata tag list, metadata mappings, Folder/Auto Sync settings and galleries, etc. The technique is quite simple. You start by creating an empty new catalogue with the new version's client and then customising it exactly as per the existing catalogue. A key point is that the custom fields must be set up exactly the same way and use the same name is. If you use Portfolio's defaults this isn't really a problem but if you have added a lot of fields particular to your organisation little more planning is required. Unfortunately there is no way to export all the details of your existing custom fields so you will need to make these down, if necessary by opening the custom fields dialog in administration mode and manually noting the details. Borders, Saved Views, custom field Predefined Lists and be Master Keyword List can all be exported as text files and imported into new catalogues. Gallery names and configurations, Saved Finds and Folder/Auto Sync settings cannot be saved and will need to be manually recreated. So, this may be a fair amount of work although the Catalog Types feature introduced in v8.5 should make this process much easier in future. If you have very large numbers of previews and/or many of your originals on unmounted drives/CDs/etc then it is worth considering a scripting method to enable you to reuse the current set of previews rather than remake them from scratch. To do this create a new custom field in the existing catalogue and use scripting to copy each records Item ID number into that field. When making your new catalogue ensure this custom field is also created. You are now ready to move the data. This is a simple as opening both the new catalogue and the old one (as read-only) directly in the new client - i.e. unserved catalogues. Tile the two catalogue's windows. Now select all records in the old catalogue and drag them into the new one, record data will be transferred. The data for any fields in the source catalogue not found in the target catalogue will result in that data (only) not being stored in the target catalogue. Where you have thousands of records you are advised to do the dragging in batches of about 5-10,000 otherwise you may find that you hit internal resource limits on the host computer and encounter unexpected results. It's hard to be specific here as to limits users had to experiment. It only save to say that the more powerful the computer a larger the data block you can copy via drag and drop. Once all the records have been dragged to the new catalogue closed the old one and test the new data. If happy, you can serve the catalogue and start setting up features like Auto Sync that require Portfolio Server. If you wish to use screen previews you will need to set up a new target folder and then select all records before regenerating thumbnails (Item menu). If you previously saved the old Item ID data in a custom field you can now use this with a script. You need to write a script that looks at each record's old Item ID value, locate its preview image in the old catalogue's preview folder, then copy/rename the file to the new catalogues preview folder using the records current Item ID value. There is no vendor script provided for this you will need to do do this yourself (or get someone suitably skilled to do it for you!). In a few scenarios, it may well be much more time efficient to simply create a new catalogue in the current version and recatalogue the files. For example, if you had a catalogue created in v3 with a few thousand JPEG files that all have embedded IPTC keywords and descriptions, it would hardly be worthwhile downloading and installing version 4, backup and update the catalogue, then do the same in version 5 and again in version 6 before eventually arriving to 8.5. As custom fields were less used in v3/v4 it's likely there's far less custom metadata, those version predate XMP and not many people (except some stock libraries in this context) were embedding data. Another compromise - you might install just the oldest needed client and use that to export all the custom field data, plus Keywords and Description. Then start over with a new catalogue before importing. It might be you've no embedded metadata and you just want a catalogue of what's where - again start over. Congratulations, you've upgraded your catalogue(s). 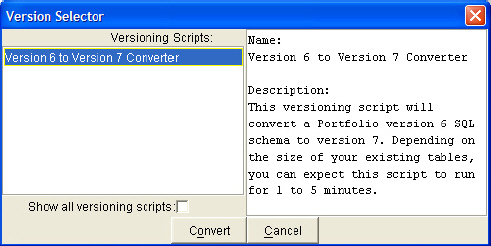 SQL catalogues are upgraded using tools in the Portfolio Server application folder. If doing this the first time you are strongly advised to contact Extensis Technical Support to ensure you have the right tools, especially if not simply upgrading from the previous version. In broad strokes the process involves running an update script on the SQL server. 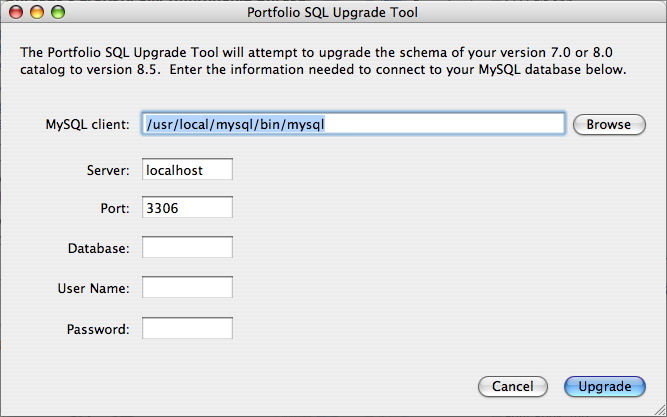 On Mac OS (Portfolio Server v8+) there is an applet in the application folder called 'Portfolio SQL Upgrade Tool.app'. Run this and fill in the boxes on screen to upgrade your catalogue (there are no instructions in the Server manual).